Happy Monday, all - how was your weekend? Those of you who are following along with me, reading FRENCH WOMEN DON'T GET FAT, how did you fare? I had a lovely weekend with many, maaany indulgences; my Friday night was positively Bacchanalian. But that's one thing I love, among many, about Mireille Guiliano's philosophy: have fun now and compensate later. I fared a bit better on Saturday, and Sunday I got right back on track with much more realistic portions of both food and drink. This morning it's back to walking and light meals. And I already feel a difference. I do. I may not actually be lighter but I certainly feel it. The biggest contributing factor to that, I think, is that I'm no longer eating until I'm full...I'm eating until I'm satisfied...which are two totally different things. Even Adam said to me, "I forgot how great it feels not to be stuffed!" Adam and I are thoroughly enjoying rediscovering flavors and textures, and Bug said that my walks along the river sound nice and she'd like to join me. I feel like our household has come back online. In the end, seasonality is the key to the French woman's psychological pleasure in food - the natural pleasure of anticipation, change, the poignant joy we take in something we know we shall soon lose and cannot take for granted. Man, I love that. Just...love. I never embraced seasonality before "going French" and, once I did, it was a whole new world. Now, am I major stickler for it? No. I have been known to buy a pint or two of cherry tomatoes to get me through the winter. But asparagus or strawberries? I never (seriously, never) buy them out of season because I feel like they are just that much better in season than out. I'm very lucky in that I have the Union Square farmers' market a short walk from my apartment so I get a lot of my produce there. But Fresh Direct (a grocery delivery service in NYC) also has a ton of seasonal, local options. And I know other cities and towns around the U.S. are the same - when we lived in Olympia, WA, there was a gorgeous market, and my parents living in Folsom, CA also have great access to local, seasonal produce. Seek out your local markets if you can. 1. Preheat oven to 300 degrees. Heat waffle iron until very hot. 2. Whisk flour, sugar, baking powder, baking soda, and salt in a large bowl. Set aside. 3. Using an electric mixer, beat egg whites in a medium bowl until medium-soft peaks form. 4. Whisk egg yolks, butter, buttermilk, and soda water in a medium bowl; gradually whisk into dry ingredients. Gently fold in egg whites (don't overstir!). 5. Coat waffle iron with non-stick spray. Pour small amount of batter onto iron (amount of batter needed will vary according to machine). Scatter about 1 tbsp. ham and 1 tbsp. cheese over each waffle. Add a small amount of batter to cover. Cook until golden brown and cooked through. Transfer to a baking sheet; keep waffles warm in oven between batches. Serve with butter and warm maple syrup (I also liked jam on mine). NOTE ON KID-FRIENDLINESS: It's waffles. Always a hit. I made one waffle with no ham or cheese for Bug. But she finished it and wanted more...so she just ate a ham-and-cheese waffle and loved it. She ate more leftovers the next day. Instead of a spinach salad on the side, Bug got apple slices. A NOTE ON FRENCHNESS: Yep, this is how we eat while we're embracing a French lifestyle and even losing weight. The key is portion control. Pre-2005...and even two weeks ago...I would have eaten two full squares, maybe more. Not this time. I had one square and stopped: was I satisfied? I decided to have half of another one. Delicious. Then I stopped. Eating only 25% less may not seem like much but it is little choices like this that add up over time. 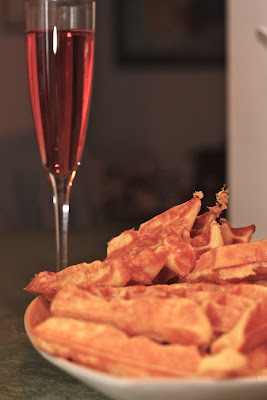 WINE NOTES: Yep, I've got wine notes for waffles. Treat it like brunch and go for bubbles: Prosecco, Cava, or Champagne. I'm a particular fan of the Llopart Rosé Brut Reserve Cava 2008, which I get from Fresh Direct - the pink hue has such a celebratory feel to it. Eat, drink, and embrace seasonality.